So, what is an electronic cigarette? An electronic cigarette, more commonly referred to as an “e-cigarette,” is a battery-operated device that acts as a cigarette. They can be purchased at your local convenience store, online, and at other venues such as vape shops. E-cigarettes allow their users to enjoy nicotine in an array of vapors and flavors. Unfortunately, the general health risks of these stand-in cigarettes are still widely unknown. There’s even less research and data describing the effects they may have on oral health. These devices contain a metal heating component which vaporizes the cigarette’s contents, including chemicals, nicotine, additives, and flavorings. It’s likely that these ingredients affect the health of users. The National Institute of Dental and Craniofacial Research (NIDCR), has suggested that more research is needed to better understand the effects of these aerosol ingredients. It’s possible that the chemical mixtures can affect the mouth, the gums, and the surrounding tissue. 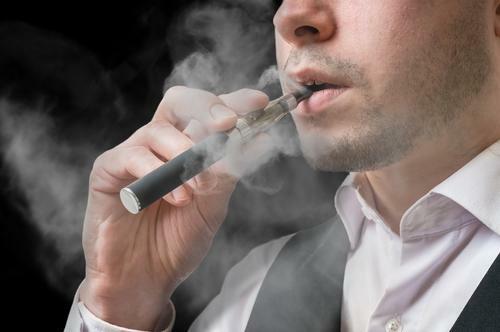 Some early research suggests that users of e-cigarettes have a higher risk of developing oral cancer and periodontal disease than people who do not smoke. The NIDCR has begun developing initiatives to encourage and support further research into the long-term effects of e-cigarette smoking habits. Until more information is discovered and confirmed, you should exercise caution and consult with your dentist concerning any issues that may arise relating to your gums and oral health. As always, it’s important to maintain a healthy, oral hygiene regime. Brush your teeth at least twice a day and floss regularly. Remember the long-term effects of utilizing e-cigarettes are still unknown and could be detrimental to your oral health.